Remnant Comment: While this development may well prove to be a good thing, at first glance it is somewhat confusing. From the vantage point of an outside observer, it looks something like a general manager of a baseball team announcing his intention to keep his two previous baseball managers knocking around the front office to "advise" the new guy on how to establish a different style of leadership. Bit awkward for everyone. Keep them around if you want, but why make the big announcement that seems to send mixed signals? Without wishing to take anything away from the good job done by either of these men in the past, I'm sure the SSPX leadership can appreciate why some traditional Catholics are a bit apprehensive over this announcement, since they were looking forward to the fresh approach of a 'new coaching staff' rather than an apparent reshuffling effort that may mean 'business as usual' when it comes to a whole host of problems blamed, fairly or not, on the previous 'coaching staff.' And this includes ardent supporters of Bishop Fellay, who only want what is best for the Society. The SSPX General Chapter is still in session, by the way, and therefore this brief observation is meant only in a constructive sense-- as merely the initial reaction of just one member of the Catholic press, while there may still be time to amend or clarify. Whatever happens, let's redouble our prayers for the SSPX--a crucial player in the Catholic restoration movement--and let us pray for the success of their General Chapter. If THEY DOUBTED ( ALL OF THEM) how could they worship Him? 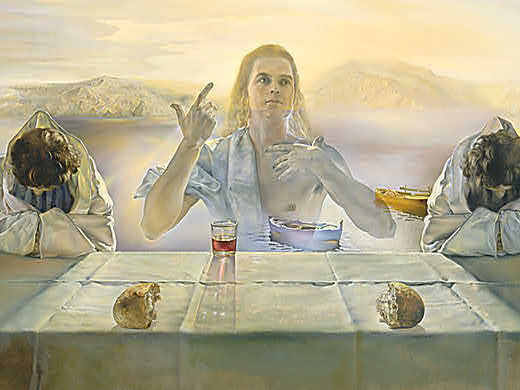 REMNANT COMMENT: At this moment, when so many of us are disheartened and even fearful for the future of the Church and of our children and even our own final perseverance, it is understandable that we might be tempted to find reason to lash out at this report because not all of these new young priests hail from the society, fraternity or institute ofwhich we personally approve or support. 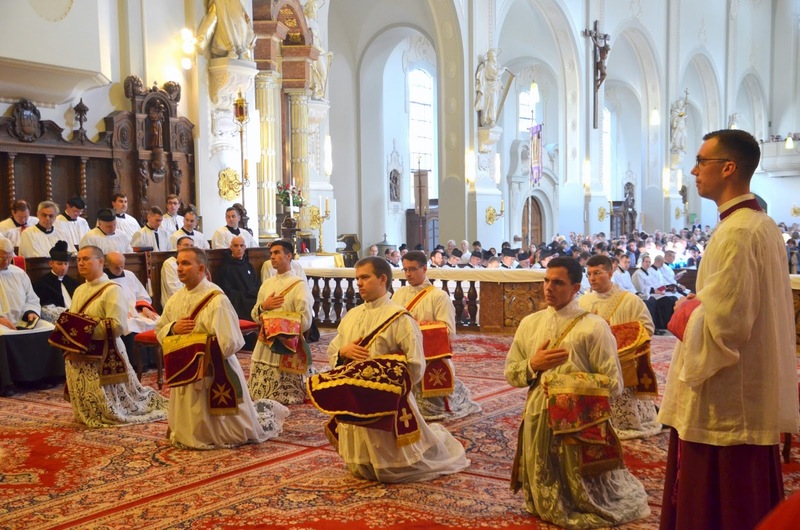 But I wonder if it might not still be possible for all of us to take a moment to reconsider this and to instead offer a word of thanks to Almighty God that, regardless of the affiliation of these young men, they nevertheless have managed to hear and answer His call to the holy priesthood and to the celebration and promotion of the Traditional Latin Mass. Let's try to not lose sight of the fact that it is because of the solid prayer life of these new priests as well as their careful attention to their vocations in life--it is because of this that tens of thousands of young people and thousands of families over the next fifty years will have access to the traditional Sacraments of the Church, to orthodox catechetical formation, to weekly confession, to daily Mass--the Mass of the Saints and Martyrs, the 'most beautiful thing this side of heaven'--and to the authentic Catholic parish life. In cooperation with God's grace, think of what that means to so many thousands of would-be lost souls who will now have access to the spiritual means that help us all to fulfill the reason God gave us life in the first place--to know, love and serve Him in this life so that we can be happy with Him forever in the next. Nothing is of greater import to souls than this. Nothing will do more for the common good of our society than this. God in His mercy and in His good time will help us all to overcome the divisions that exist between us--divisions that admittedly are not insignificant. But regardless of the post-Vatican II turmoil in the world today and the accompanying doubt and loss of faith, it was nevertheless His voice that each and every one of these young men heard at some point over the past decade--even despite the unrest, the apostasy, the rebellion, the weeping and gnashing of teeth in the Christophobic modern world. In this year of Our Lord 2018, somehow in God's providence, 42 young men decided to shut out the noise of war, revolution and temptation all around them, in order to make quiet commitment to give the rest of their lives to God's service and to the service of the Church-- which is to say the service of us all. No wives. No children. No glamorous careers. No piles of money. Just service to souls. If we cannot find it in our hearts to celebrate this happy reality--that somehow these young men made it through the storms of doubt and uncertainty and temptation...that somehow their mothers raised them with enough faith, hope and love to shut it all out and to answer the call to the Holy Priesthood--if we cannot celebrate this, then perhaps we're losing focus on the point and purpose of our movement and indeed the point and purpose of why God put us on this earth in the first place. May God bless and keep these young men; may He help us all to take comfort from their young example of commitment to His service; may He show us how to understand what He wants of us and even where He wants us to be. And may He never abandon us by leaving us spiritual orphans in a world without Catholic priests, without the alter Christus, the knights of Our Lady, the servants of the altar of sacrifice. We thank God for these young priests, we congratulate them, and we ask them to pray for us all that our faith will not fail us just as theirs has obviously not failed them. Tu es Sacerdos in aeternum secundum ordinem Melchisedech. Featuring 21 new articles, most of which will never appear online. - Michael Matt's suggestion for a bit of Catholic action surrounding the Sacred Heart. - Chris Ferrara adds perspective to the Christian cake maker case. - Hilary White goes after another evil spirit of Vatican II. - What's up with the attitude of US bishops regarding Trump and immigration? Back in March, parishioners of St. John Cantius in Chicago were shocked when a letter from Chicago’s Cardinal Blase Cupich was read at Mass, informing them that Fr. Phillips had been removed as pastor over accusations of “improper conduct” with adult males. …And Cardinal Cupich is about as liberal as it gets. The Review Board concluded that Fr. Phillips has not violated any secular criminal, civil or canon law. COMMENT: Father Phillips is a well-respected Catholic priest who upholds traditional Catholic morality, stands strong in defense of marriage and is wide open to the Traditional Latin Mass. Will he be given a fair hearing and due consideration from the radically liberal Blase Cupich? Only time will tell. BUDAPEST, June 20 (Reuters) - Hungary's parliament on Wednesday approved a package of bills that criminalises some help given to illegal immigrants, defying the European Union and human rights groups. Orban's right-wing Fidesz party tightened its grip on parliament in April elections after campaigning on an anti-immigration platform. Fidesz also demonised Hungarian-born U.S. billionaire George Soros and the liberal NGOs he backs, naming the new legislation the "STOP Soros" law. "The Hungarian people rightfully expect the government to use all means necessary to combat illegal immigration and the activities that aid it," Interior Minister Sandor Pinter wrote in a justification attached to the draft legislation. "The STOP Soros package of bills serves that goal, making the organisation of illegal immigration a criminal offence. We want to use the bills to stop Hungary from becoming a country of immigrants," he said. Maybe this isn’t a slam dunk, after all. I mean, let’s face it--George Soros isn’t exactly Julius Felsenburgh. He comes off like a campy Bond villain---grotesque, yet laughably over-the-top. Not everyone in Europe is as enamored with this character as are liberal Democrats on our side of the pond. In any case, it’s beginning to look as though the 'world without borders’ cartel may have jumped the shark. If we're picking up this much nationalist chatter on our side of the Atlantic, one can only imagine how much more there is on the ground over there where, suddenly, it's quite the winning hand for European politicians to go up against the mighty EU. Whatever it is, this is fun to watch. The wheels of the EU Crazy Train appear to be coming loose.